A little bit of history: The Manuscript Pen Co Ltd are based in Shropshire, where they have been producing nibs and calligraphy pens since 1856. Despite their vintage they evidently love coming up with new products and this holder with interchangeable leads set is one of their latest. How it looks: The big pack arrives in one of those tricksy-to-open plastic blisters, packed with everything that you need to get cracking on your pencil calligraphy; a lead-holder, five different lead colours (including graphite) for you to play with and a nifty glass ‘sharpener’ to help you keep a good edge on your leads. There’s also a more select pack for those who just want a lead-holder and some italic graphite. Crucially, how it writes: Uniquely! When have you ever seen big wide italic lead before? It takes some getting used to, and perhaps as a factor of the rectangular manufacturing process the graphite/crayon is remarkably hard. While our reviewers had fun with it and it DOES work, some felt that their own calligraphy skills were not good enough to show the product off to its best advantage. The coloured lines produced were quite faint. So, while it could be fun for kids, a concern might be whether the results will look smart enough to encourage them to take calligraphy further. However, a good calligrapher could create something special with this. Lead! What is it good for? It’s an innovative product that offers a less messy way for beginners to try their hand at calligraphy. It could be especially fun for children and using the coloured leads instead of inks means that parents can relax without worrying about their soft furnishings being ruined. In the hands of a good calligrapher, the results from this pack could be a contemporary blend of the rustic and the stylish. VFM: At the moment, a version of this product can be purchased from John Lewis for £20.00. We think that’s quite steep for a pencil, but also not crazy money for a product as unusual as this. If this isn’t quite your cup of tea, but almost: then why not try calligraphy with an ordinary pencil? Any pencil that is blacker, rather than harder (ie B rather than H) will be fun to try calligraphy with. Try anything from 2B to 5B or maybe 6B. But watch out for smudges! The softer the lead, the more smudges you can make, so protect your paper as you work. Or just let the kids go crazy – the choice is yours! Alternatively, it is possible to buy the italic leads on their own from Manuscript direct, and they should work with any 5.6mm lead-holder you already have. Our overall recommendation: The Manuscript Calligraphy Lettering Pencil is a fun and innovative product for a style of writing that has remained popular for hundreds of years. In the hands of a good calligrapher it could perform marvels – but we think caution is advised for beginners, as if your lettering skills aren’t that wonderful, the initial results may leave you less than enthusiastic to pursue calligraphy further. Can you believe it? It’s December ALREADY! This year has flown by. I don’t know where it’s vanished to at all; possibly down the side of the sofa with all my pound coins! We are at the last United Inkdom giveaway of 2018. So, ladies and gentlemen (and all shades in between), the United Inkdom review team present to you… the BeNu Friendly Chameleon! Let me tell you a little bit about this pen. She’s a VERY attractive Russian pen, part of the BeNu range (all hand-made and equally strikingly coloured) and retails for $90 (converter extra). Read what the United Inkdom reviewers said about it HERE. What do you think? Isn’t it just the best-looking pen? This lovely creature could be delivered to your door by Hogmanay! Just think, you can start your 2019 journalling with this classy fountain pen and it won’t cost you a bean! Interested? To take part this month, you should be resident in the UK and sign up to receive updates for the United Inkdom blog by email (hit that red ‘ink me up’ button). And that’s it! The giveaway closes on 22 December, with a winner drawn before 24 December. And providing we get the winner’s address details in good time, the BeNu Friendly Chameleon will be with you before 31 December. And if you’re not the lucky winner, why not visit the BeNu site and check out their whole range – that Christmas present money isn’t going to spend itself! Newsnibs special – Made For Ink! Hot news – well, as hot as it can reasonably get in this unseasonably frosty weather… Rutland’s very own stationery supremo, known to us all for his previous exploits as the provider of Personalised Stationery, has just branched-out into a line of notebooks specifically crafted for fountain pens and tested by several members of the Fountain Pens UK Facebook group. Logically enough, it’s called madefor.ink! We’ll get a meta-review of some of these products together as soon as testing schedules allow, but in the meantime there’s a quick review of the EDC pocket notebook already up and, more importantly, the site is celebrating World Fountain Pen Day with a handy discount: use the code PENSAREGREAT to get 20% off. Well, that’s a message we can all agree with. A little bit of history Based in Moscow, Benu burst into the pen scene last year with a range of striking designs. When they offered us one to try, we said да! How it looks The Friendly Chameleon itself is indeed very striking. The barrel is a squared off triangle, with a matching cap. The resin is beautiful with a whole lot of shimmer and sparkle. It truly is chameleon-like, changing appearance as it catches the light at different angles. All our reviewers loved this resin but some felt the overall appearance was let down slightly by the black plastic centre and grip sections. It’s all a matter of taste and a pen with these kinds of looks is bound to provoke a wide range of reactions. How it feels Surprisingly comfortable. There’s quite a step down from the barrel to the section but the section’s long and so your fingers are safely out of the way. The pen’s width and light weight mean it’s comfortable to hold for extended periods. The cap is light and so doesn’t throw off the balance when posted. The shape also means the pen won’t roll away – always a plus with a clipless pen. How it fills Benu very sensibly use an international standard cartridge or converter. Crucially, how it writes… The nib is a generic steel Schmidt #5. The one on our review unit had good flow and behaved itself very well with no skipping or hard starts. It had some feedback which we felt was just the right side of acceptable but might not be for everyone. It isn’t the greatest nib but it works well and is easily replaced. Pen! What is it good for? The Friendly Chameleon writes well and is comfortable in the hand and so, fortunately, is an excellent pen for doing lots of writing! It’s also good for just gazing into, while waiting for inspiration to strike. VFM At $90 (plus another $5 for a converter) this isn’t a cheap pen but it’s unique in shape and colour. It would be good to see a higher quality nib but if you like the design (and, let’s be honest, you’re going to either love it or hate it!) then a pen that works well and is this unusual is good value at this price. If this isn’t quite your cup of tea, but almost… It’s hard to find a pen with these kinds of looks at this price. You’d usually be looking at something bespoke, for a lot more money. So if you almost like this pen but aren’t quite sure then you might be best off looking at the rest of Benu’s range. Our overall recommendation The Benu Friendly Chameleon is a good pen and all our reviewers would recommend it, if you’re seduced by its looks! Where to get hold of one Benu sell internationally direct from their website. Thanks to Kate in Moscow for sending us the pen to try out. A little bit of history Tolkien left more entertainment for etymologists than anthropologists in his writings, and the latter would probably not be wildly impressed at the idea of a being who was half knight, and half elf. Such, however, was supposedly the provenance of Elrohir, and it’s a fitting name to borrow for a product made in a stable, using saddle-making techniques – although we can confirm that no elves were employed in the making of this review. The Elrohir operation is in fact run by a very nice human called Mischa, based in Wales rather than Rivendell, and we were encouraged to find out more about what she does by one of our regular readers from Middle Earth (well, Melton Mowbray, but it’s near enough). What came our way were two remarkable notebook covers; an A6 steampunk number and a blue A5 mandala affair, complete with multiple interesting refills. How they look Frankly astonishing. Everyone we show these to responds with some variety of ‘wow’. The designs are embossed, so they’re quite tactile too. The range is quite a challenge to describe, so a quick look at Elrohir’s Etsy page is worthwhile now. No, seriously, right now! How it feels Weighty, rugged, and ready to last a life-time – and yet remarkably refined. Like the sort of saddle you’d put on a thoroughbred, probably. How it fills With as many simple cahier-style exercise book refills as you care to thread in. The A5 version we tested could take five or six, which did make it a bit tough to hold flat and write in – but of course thinner versions can be made available with a swift email to Mischa. Customisation is very much encouraged. Crucially, how it copes with a fountain pen… Mischa’s own inserts come in a variety of plain and coloured papers, and all we’ve tested so far seem happy making friends with a proper nib. They look the part next to a real pen, too. Book! What is it good for? These are built to last, but we think maybe a little too lovely to take to work (unless you work with elves, of course). For a travel journal, recipe collection or grimoire-in-development, though, it’s almost certainly exactly the thing. VFM These cost about 30% more than the equivalent standard product from Start Bay – so not cheap, but nevertheless remarkably reasonable for such an unusual product. We certainly couldn’t complain. If this isn’t quite your cup of tea, but almost… These are two very fine examples of Mischa’s craft, but if you prefer something a bit different – a cover depicting bats flitting through the night sky, perhaps – it’s worth having a look at the Elrohir range. We’ve yet to come across anything quite comparable from another maker. Our overall recommendation Have a browse, save a few pennies, and get one. 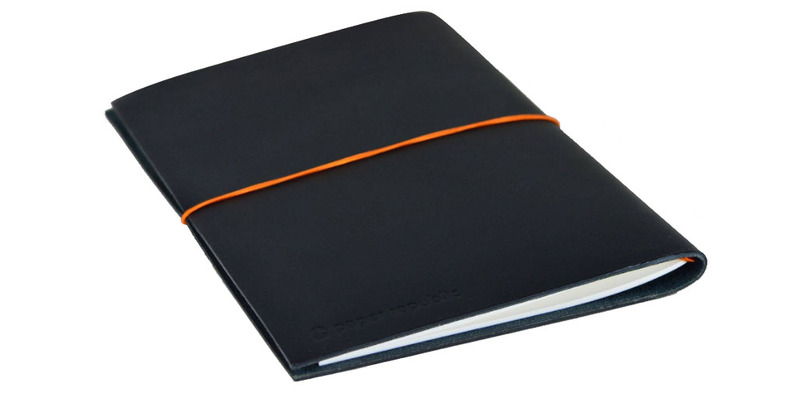 If you’re after a robustly decorative notebook cover, these will take some beating. Where to get hold of one Go straight to the source and talk to Mischa! Her Etsy page is a good place to start. Thanks to Mischa for getting a couple of amazing samples our way. Most of us didn’t want to let them go, and that’s a recommendation! A little bit of history Once upon a time in the west, or the western hemisphere at least, there were fine upstanding fountain pen makers like Parker, whose Penmanship Blue had a nice, subtle, red sheen on it, which made handwriting shimmer gently in the right light and, thirty years later, made otherwise sensible shoppers absolutely do a nut-job and blow staggering piles of cash on half-empty bottles just to dip their nibs in this apparently magical writing elixir. It got a bit silly, frankly. Then ink specialists here in this century started making their own, and things became calm and sensible once more. Well, mostly. Here are three of the new contenders, from Amurrka, Oz and Blighty, slugging it out head-to-head – as if civilised ink would stoop to anything of the sort! Tsk. How it looks Our three selected inks all look like high-quality, but ordinary, blue inks as they go on to the page. Robert Oster’s Fire & Ice is a light blue verging on turquoise, Diamine’s Germany-only Skull & Roses is a richer ‘royal’ blue, and Organics Studio’s Nitrogen Blue is somewhere in between. Then, once dried, they exhibit a red sheen when you twist them in oblique light. It’s a neat trick. How it behaves on the paper Perfectly well; these all come from serious ink manufacturers with reputations to protect, so there are no major problems. Drying times can occasionally be longer than expected, however, particularity for Nitrogen. How it behaves in the pen Again, pretty much as standard fountain pen ink does, although sheen inks can lead to a build-up of sediment eventually – and several of us have found ebonite feeds turning a fetching shade of red! Fortunately, it’s nothing that a good rinse won’t fix. Ink! What is it good for? The art of correspondence may be dying fast, but if anything’s going to bring it back it must surely be the excuse to use inks as alluring as these. It makes boring blue interesting again, after all. VFM Good quality sheening ink is generally a ‘premium’ product at present so you may have to pay a little more – but if you enjoy the effect, you’re unlikely to find the modest uplift a major penalty. Our overall recommendation Give it a go. The effect is very pleasing and the ink is easy to live with, even in fussy thoroughbred pens. Skull & Roses is the trickiest to get hold of despite being made here in the UK, but that’s just the result of an exclusive deal – and Diamine could undoubtedly come up with something even better for full global distribution in due course. In the meantime, Fire &Ice if you like Turquoise, or Nitrogen if you like full-on royal blue with all the trimmings, are well worth a try. Where to get hold of some For Skull & Roses, you have to buy from Germany – but there are numerous tintenshoppingspecialisten (Nein, das ist kein Neologismus!) on the web, or even Amazon if you really get stuck. Executive Pens Direct stocks Fire & Ice, while The Writing Desk carries Nitrogen amongst a a fairly wide range of Organics inks. A bit of internet research will produce the goods without too much heavy trawling. Thanks to Diamine for the rare sample of Skull & Roses, Executive Pens Direct for the sample of Robert Oster’s Fire & Ice, and The Writing Desk for shipping some Nitrogen this side of the pond.